J's birthday is coming up the Sat after Thanksgiving. Because the holidays get hectic, we had her party a little early -- today. Back in August, after much debate, I decided to have her party at the St Louis Carousel. We invited all her friends, ordered cupcakes with purple icing and hired a balloon twister and waited, and waited until the big day. She was soo excited all day today! 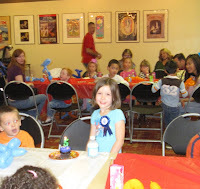 Most of the kids from her pre-school class attended, we had snacks and the cupcakes, the kids rode the carousel as much as they wanted, but best of all was the balloon twister. This guy was not a clown making basic balloon animals. 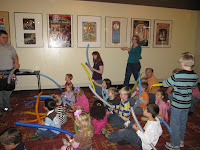 He made all sorts of balloon art creations for the kids. 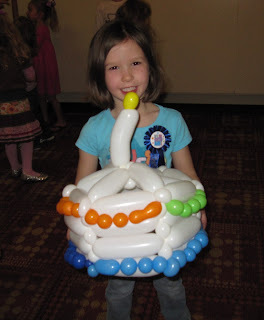 He made J a balloon birthday cake, M got a crown, I saw multiple wands and swords, a race-car, sponge bob, penguins, a baseball mitt with ball, and a hula girl. He even spent 15 minutes and taught all the kids to make a basic balloon dog and surprisingly they all did a great job (with a little help from the parents). 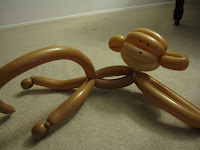 At the end he made J a balloon monkey. He definitely earned his paycheck -- he worked non-stop for 2 hours. What a great source of entertainment for the kids!